On Thursday morning, Sept. 11, 2014, cadets from the University of North Georgia's Corps of Cadets fired a cannon on the university's Dahlonega Campus to mark the instant when each of four hijacked airliners crashed into the World Trade Center, the Pentagon and a field in Somerset County, Pennsylvania, on Sept. 11, 2001, killing almost 3,000 people. Hundreds of students, faculty and staff members at the University of North Georgia (UNG) were joined by the community on Thursday night for a candlelight ceremony marking the 13th anniversary of 9/11. participated in a candlelight ceremony on Thursday, Sept.
11, 2014 to mark the 13th anniversary of 9/11. The Student Government Association (SGA) held the ceremony on the Gen. William J. "Lipp" Livsey Drill Field on UNG's Dahlonega Campus. The ceremony recognized all community and campus emergency services personnel. On Sept. 11, 2001, 19 terrorists hijacked four airliners and crashed into the World Trade Center, the Pentagon and a field in Somerset County, Pennsylvania, killing almost 3,000 people. 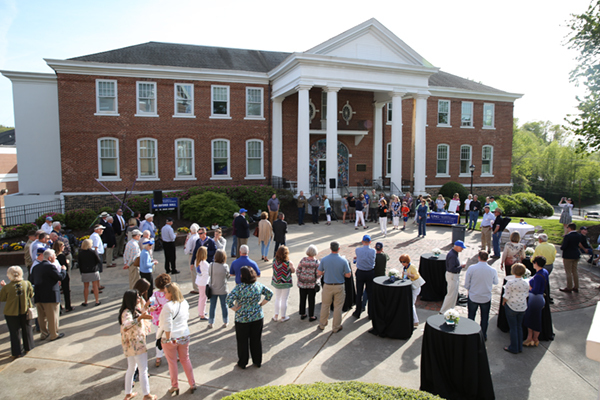 "This is a particularly poignant event for UNG, due to our specialized mission to prepare and educate students to work and serve in a global society, including students in our Corps of Cadets who are preparing to enter the military to serve our country and defend our freedoms," UNG President Bonita Jacobs wrote in a message to the university's faculty and staff. While many college students were in elementary school when the attacks happened, living in a post-9/11 world with the war on terror still ensuing today has had a profound impact on them and the university community. "Most of us remember where we were and what we were doing on Tuesday, Sept. 11, 2001. We gather here today in memory of those who lost their lives," said Jared Lee, senior representative for Dahlonega SGA. "Thirteen years later we still remember the fallen, but we also remember how this terrible event has brought us together as a nation. The United States is a great nation and its people are resilient." The ceremony's guest speaker was Larry Glover, a cadet staff sergeant of Charlie Company and a student on the Dahlonega Campus. Glover deployed with the 4th Battalion, 3rd Aviation Regiment, 3rd Infantry Division out of Savannah, Georgia, and spent six months in the Kandahar district of Afghanistan as a UH-60 Black Hawk crew chief. "On that one morning, our nation's outlook and stance on freedom was forever changed. For 13 years, we have continually brought the fight to those who mean to do us harm," Glover said. "Since 9/11, more than 3,400 troops in Afghanistan, and 4,800 troops in Iraq have gone to rest after defending this nation. We should be proud that we have people who are rugged and steadfast and are willing to do what must be done, not for personal gain or glory, but for the love of their fellow man, not only Americans, but the world as a whole." On the Dahlonega Campus, the Corps of Cadets fired the retreat cannon at the time of each plane crash on Thursday morning. UNG is one of only six senior military colleges in the country and is designated as The Military College of Georgia and its Corps of Cadets numbers more than 800. The Dahlonega Campus is also home to the UNG Memorial Wall, which stands in honor of the university's alumni who died in service to the United States, including during the global war on terror. * This story was corrected on Oct. 9, 2014, to accurately indicate that the event was sponsored only by the Student Government Association.